“ClixSense”, found at clixsense.com, is a middleman website for many market research companies that pay you through different methods to view ads, take surveys and complete tasks. The site also offers to users its own games, contests and online shopping services. They’ve been around since 2007 and it’s free to join globally. There is an upgrade to premium for which ClixSense charges a $17 fee. Minimum payout on credited tasks is no less than $10 through AlertPay. For advertisers and publishers, ClixSense offers their one click per user protection service, analytic stats and demo filtering among other services. This service can be used for as little as $5 dollars per campaign. For those wanting the affiliate program they pay ten cents per referral, and two bucks if they upgrade, and a dollar for every one they bring in that joins as a premium member. With over 3 million members since 2007, you will find a mixture of both satisfied and unhappy customers that have experience with ClixSense. 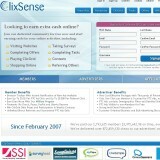 The premise of ClixSense is that you get a penny for viewing an ad you click on for at least 20 seconds. That’s 3 cents a minute or $1.80 an hour. They break it down to fractions of that when you view the ad for less than the minimum required time. It’s a sobering reality when you see what your time is worth to them. It’s hard for me to justify getting involved with something that pays so insignificantly for your valuable time, so I have to say I would not recommend ClixSense as anything more than a hobby in your spare time, if you like wasting it for so little in return.